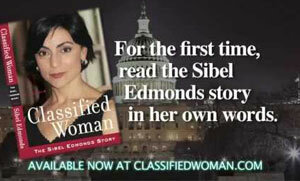 By David Swanson - Sibel Edmonds' new book,"Classified Woman: The Sibel Edmonds Story" (352 pages, $21.95 trade paperback, available from Amazon.com in print and Kindle editions) is like an FBI file on the FBI, only without the incompetence. The experiences she recounts resemble K.'s trip to the castle, as told by Franz Kafka, only without the pleasantness and humanity. I've read a million reviews of nonfiction books about our government that referred to them as "page-turners" and "gripping dramas," but I had never read a book that actually fit that description until now. Had Edmonds understood the truth of that statement, it might have saved her years of frustration and stress, but it would have denied us the bulk of the revelations in her book. Dickerson threatened Edmonds' life and those of her family. Edmonds lost her job, her reputation, her friends, and contact with most of her family members. She watched Congress cave in to the President. She watched the government protect the Dickersons by allowing them to flee the country. She listened to Congressman Henry Waxman and others in 2005 and 2006 promise a full investigation if the Democrats won a majority, a promise that was immediately broken when the Democrats took control of Congress in 2007. Edmonds was smeared in the media, and her story widely ignored whenmedia outlets got parts of it right. The Justice Department claimed "States Secrets" and maneuvered for a cooperative judge (Reggie Walton) to have cases filed by Edmonds dismissed. The government classified as secret all materials related to Edmonds' case including what was already public. The Justice Department issued a gag order to the entire Congress.